Spring Plants Class is now open for enrollment! Learn plant identification and planting design concepts by observing native and edible plants in a variety of different environments. This class will include numerous field trips - afterall, the best way to get to know plants is to see them in the field. 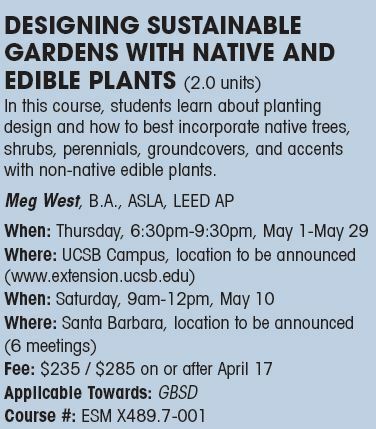 We will visit the Santa Barbara Botanic Garden, the Goleta Water District Edible Garden, Fairview Gardens, and various native restoration projects at UCSB. Classroom time will be used to learn botanical nomenclature, planting design concepts, and graphic communication skills that will help you refine your planting design ideas. Want to learn how to install a laundry to landscape greywater system that waters your plants? Visit Oasis Design, a site with a lots of information on sustainable living and water conservation.